A reputed gang member was charged this week with capital murder and other counts in the Christmas day shooting death of a Los Angeles County Sheriff's Department employee in Pasadena. Larry Darnell Bishop Jr., 20, was ordered to remain jailed without bail while awaiting arraignment Jan. 23 in Los Angeles Superior Court in connection with a vehicle-to-vehicle shooting that killed bystander Victor McClinton, a 49- year-old law enforcement technician, neighborhood athletics coach and father of two who was caught in the line of fire. McClinton, who was walking a fellow coach to his car when the gunfire erupted, was shot to death at about 11 a.m. Dec. 25 at Newport Avenue and Wyoming Street. 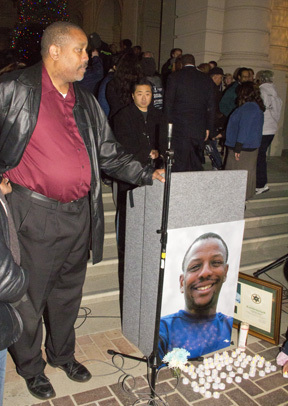 Meanwhile, the Pasadena City Hall steps was the scene of a recent memorial for the slain coach and leader. 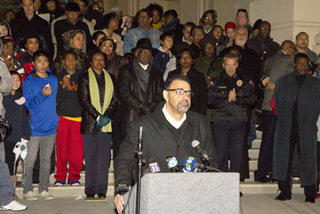 McClinton was a coach at the Brotherhood Crusade’s Community Sports League. “[He was] an uncle to my kids and a father figure who was active in our lives for more than fifteen years and was more than just a coach…[He was] just someone who was a good friend. This left a hole in our hearts,” she said. “He was sitting down on his porch, with a guy who had just brought him a gift. Two cars came down the street shooting at each other, and a stray bullet hit him in the head … two bullets actually,” explained Jacque Bolton, who first hired Victor thirty years ago at the YMCA. The murder charge against Bishop includes the special circumstance allegations of discharging a firearm from a motor vehicle and murder to further a criminal street gang. Prosecutors will decide later whether to seek the death penalty against Bishop, who was convicted of two felony commercial burglaries in San Bernardino County in 2011. Bishop is also charged with one count of attempted murder involving a driver who crashed his vehicle into a light pole after sustaining a gunshot wound, as well as one count of possession of a firearm by a felon and two counts of shooting at an inhabited dwelling. Bishop was arrested Dec. 28 by Pasadena police and has remained jailed since then, according to the Los Angeles County Sheriff’s Depart­ment’s Inmate Information Center website. Another 20-year-old man, Gary Aurthur Davis, is charged with being an accessory after the fact. He is also set to be arraigned Jan. 23. 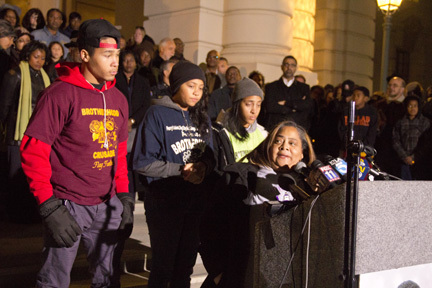 According to the Los Angeles County District Attorney's Office, there is no evidence that McClinton's shooting death was related to a brief high-speed car chase in which Tracey Ong Tan, 26, of Glendale, and her 11-year-old cousin, Kendrick Ng, of Daly City, were killed on Christmas Day in Pasadena. Reputed gang members Darrell Lee Williams, 22, and Brittany Michelle Washington, 21, were charged with murder and other counts in connection with the pursuit and deadly crash. They are set to be arraigned Monday in Pasadena Superior Court.